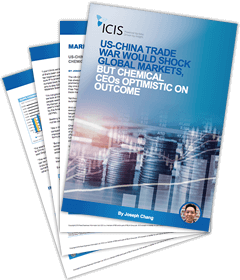 ICIS is tracking the impact on global petrochemical markets of the broadening trade dispute between the US and China. New tariffs came into force on 23 August on products imported into markets in both countries. The cost burden is shifting direct US-China trade onto other regional markets, displacing current product flows and potentially threatening the profitability of regional players in northeast and southeast Asia. Players globally are nervous globally about the impact in big markets like PE (polyethylene) and for products where the US is building considerable, low-cost, export potential. The knock-on effect from the new tariffs on many other goods and the industries that require them has yet to be effectively determined. ICIS reporters and analysts in Asia, the US, Europe and Latin America are in constant touch with the market players most directly affected by the widening trade dispute. ICIS has unlocked the following news stories which give you access to an extensive coverage of the latest US-China trade war disputes, analysis and comment articles published by ICIS. It will continue to follow this developing story. Part 1 – $34bn. These 25% tariffs were published on 11 June and imposed on July 6. Click here to see the list. Part 2 – $16bn. These 25% tariffs were published on 11 June and will go into operation on 23 August. Click here to see the list. The US Trade Representative office on 8 August said US Customs officials will begin collecting duties on 23 August. The finalised list contains 279 from the June list of 284. An updated list will be published in the Federal Register. Part 3 – $200bn. These 25% tariffs were published on 10 July and are pending. Click here to see the full list of products to be targeted by the US. The US will hold hearings on 20-23 August. On 1 August the Trump administration proposed to increase the tariff from 10% to 25%. The list is massive, exceeding 6,000 products. It includes several industrial chemicals such as olefins, aromatics, alcohols, acetyls, acrylics, anhydrides, glycols and glycol ethers. Nitrogen fertilizers and surfactants are included as well as caustic sodaand titanium dioxide(TiO2). On 15 June China said it would impose a 25% tariff on $50bn of US imports in retaliation for US President Donald Trump’s administration moving forward with US tariffs. Part 1 – Tariffs on $34bn of US imports kicked in on 6 July, which included agricultural products such as corn and soybeans but not chemicals. Click here to see this list published in Mandarin. Part 2 – China’s finance ministry also listed a second set of US exports valued at around $16bn, which include a wide variety of US chemical and energy products. On 8 August China said it would impose an updated listof these tariffs on 23 August. The new list includes, for the first time, most grades of linear low density polyethylene (LLDPE) plus all high density PE (HDPE). Ethyl vinyl acetate (EVA) has been included as well as polypropylene (PP). Low density PE (LDPE) has been removed from an earlier list. Part 3 – On 3 August China published a new list of $60bn worth of products to attract a tariff of between 5-25%. These tariffs have not yet been imposed. Click here to see a full list of chemicals. Key petrochemicals such as aromatics (including toluene and its derivatives), methanol, acetic acid, terephthalic acid (PTA), methyl di-p-phenylene isocyanate (MDI), toluene di-isocyanate (TDI) will all face a 25% punitive duty. Buy/sell with the right pricing data to make better-informed decisions and settle contracts with confidence. Want to ensure you gain the latest market-moving news on the US-China trade war?